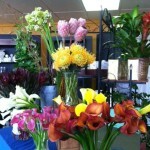 Calla lilies (in foreground) come in a variety of colors and drape gracefully. Bring the wild beauty of the tropics into your home. These warm weather blooms are great for making an impression with their unusual textures. 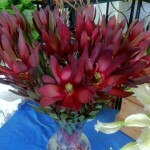 This week only mini callas are $17.50 per bunch of 10 stems. 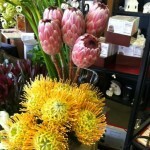 Big king protea are $6 per stem while the pincushion protea and safari sunset are only $3 per stem. Pick these up wrapped for carry out or call ahead and we’ll be happy to make a bright fun arrangement for pick up or delivery. Previous post: Thursday/Friday Specials are here!!! Next post: Thursday/Friday Cash and Carry Special!! !